JOLIET, Ill. (WLS) -- A mall in Joliet will try a new approach in combating issues with unsupervised teens. 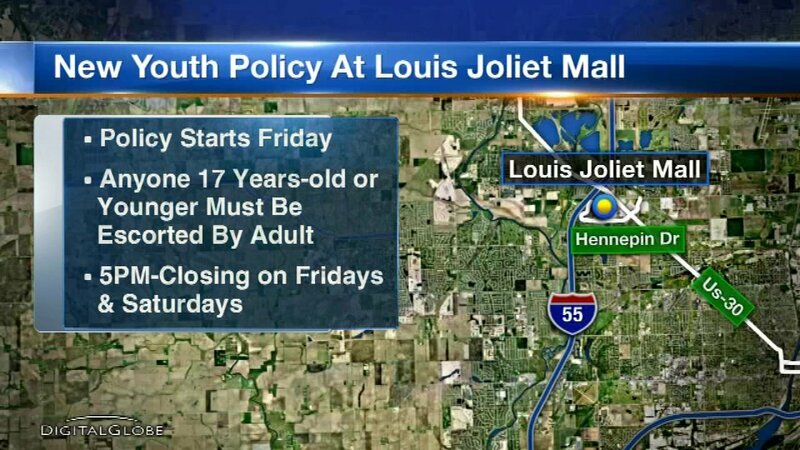 Starting this Friday, the Louise Joliet Mall will launch a youth supervision policy. The policy requires anyone 17 or younger to be escorted by an adult, parent or legal guardian 21 or older at all times on Fridays and Saturdays between 5 p.m. and the mall's closing time. Mall security will greet people at the entrances on Friday and provide a handout about the new policy. One adult may accompany up to six youths at a time. Teens scheduled to work during the policy hours will need to show a valid ID and proof of employment. Other shoppers may be asked to provide proof of age with a valid ID such as a driver's license, state ID card, military ID, passport or visa. The new policy does not apply to the movie theater in the mall.